Arnold Schwarzenegger paid a visit to the FC Barcelona first team on Friday, just before training took place at Ciutat Esportiva Joan Gamper. Schwarzenegger spent some time with Neymar and alongside two of the captains Busquets and Mascherano ahead of the team’s workout. Jordi Alba, Denis Suárez, Rafinha and Paco Alcácer also got to meet the famous actor. 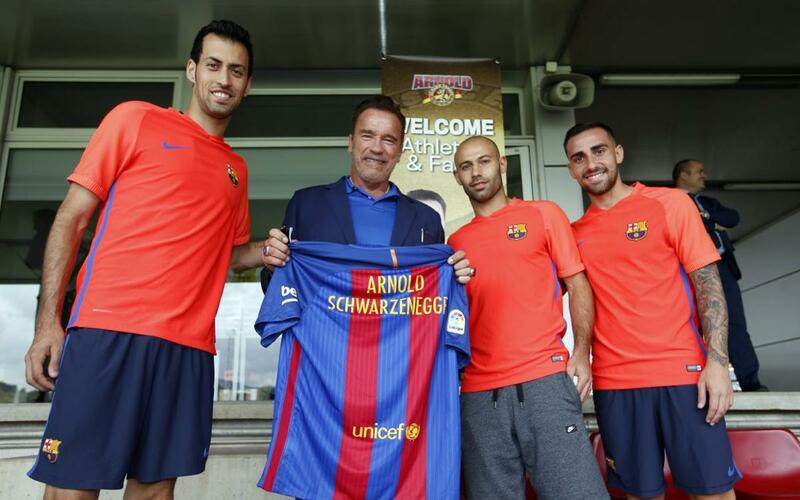 Schwarzenegger received a first team jersey with his name on the back in order to remember his visit to the club’s facilities. The actor and former governor of California was in Barcelona as part of the Arnold Classic Europe, the most important bodybuilding event in Europe, which took place from Friday through Sunday at the Fira Gran Via. This multi-sports event for lovers of fitness and bodybuilding has four editions, held in Europe, Australia, Brazil and South Africa, which Schwarzenegger attends regularly. The 2016 edition of the European event was the sixth, the first that hosted in Barcelona after five previously being held in Madrid. The Arnold Classic Europe accommodates the main national and international companies in the fitness sector, and features some 140 exhibitors. Some 60,000 people were expected to participate.